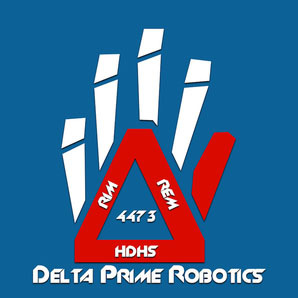 REM Delta Prime Robotics, team #4473, is a community initiative of REM involving high school students from a variety of schools, including CATC, Cony, Maranacook, Richmond, and homeschoolers. This team builds a robot from a kit and then programs it to compete in competitions. REM Delta Prime’s goal is to build a functioning 120 pound robot from the provided kit, then wire and program it to perform tasks for a game that is announced when the kit is picked up - all within a 6 week period. Professional electrical engineers, computer programmers, web designers and machinists, as well as teachers and parents from the community come together to mentor and support the team in this complex project. REM Delta Prime Robotics is being supported in their efforts by NASA and Fairchild Semiconductor of South Portland. 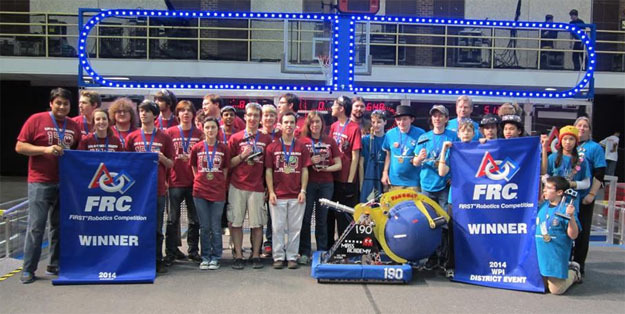 USFirst, the organizing force for the FRC Robotics program, as well as the First Lego League, FTC, and VEX robotics, all support kids of all ages in learning about technology, math, and the sciences (STEM learning). As such, the FRC program for high school students offers over $16 million in scholarship opportunities to students who participate in their programs. For more information, or to join as a team member or mentor, contact REM at 873-4444. If you would be interested in participating in REM Delta Prime Robotics in any way simply click on the button below and someone will contact you to find out how you might do so. Clicking this button means you'd like to explore ways you might like to participate in REM Delta Prime Robotics.